As soon as the mosquitos start to come out we will go inside for cake and ice cream. A few girls will be staying overnight. We’ll bring them in for the cake ceremony while the bugs are worst, and let the tiki torches kick in. *Update: You need 4 feet of blacklight to properly “light” a regular sized room. The party store was supposed to have a 4 foot light for $30, but of course it was out of stock. So I got two 2 foot lights for $20 each from WalMart. I also got three blacklight bulbs and put them in the ceiling fan fixture between the lights, but these made no difference when you flipped the light on and off. Most party spaces are going to be bigger and need more light. We had christmas lights in the other end of our open first floor. Also you need to block out the natural light, we put black trash bags over the windows and thought about covering the white walls too (but that was too much work). *Update: It was hard to get this “paintable” but it did glow. My daughter is dead-set on a slime fight. We will use a recipe from Growing a Jewled Rose. We will make it a little looser so it is easy to throw. The paint needs to charge in the sun, so I will need to “charge” the slime and then they need to have their slime fight before the glow wears off. Glow in the dark paint is $2 a bottle at my Walmart, or see it on Amazon. 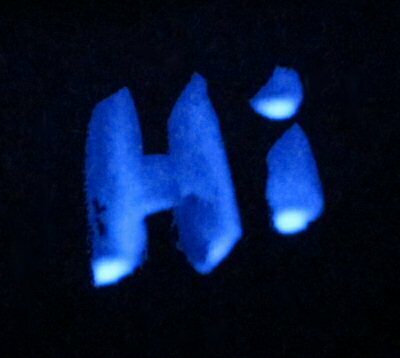 You can make chalk that will react to black light. 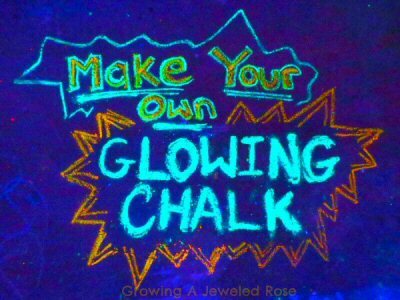 You use a highlighter to make glow water, and then soak chalk in it. (Instructions on Growing a Jeweled Rose.) I thought the teens might like to write on the road (and not get hit by cars). But if you don’t have a handheld black light you won’t be able to see it (see one on Amazon). As the evening winds down we will use the browser on the computer to listen to a custom music station on Pandora, and watch anime on the Netflix channel on the Wii. 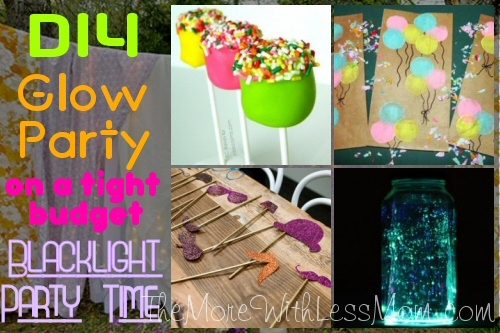 What’s the bestest blacklight party trick have you seen?